This article will explain something that’s probably been nagging at you for some time: what in the world are all these little icons that seem to be popping up everywhere? 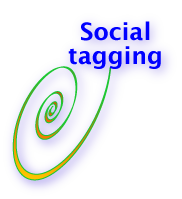 These little icons take you to various social tagging and bookmarking systems, which are an exceptionally powerful Web 2.0 phenomenon that is under the radar in 2008 but has immense potential for enterprises and individuals. Emerging social tagging solutions offer marketers an excellent means to enable customers to help each other and improve a wide range of Website metrics. The most well known tagging/bookmarking sites are B2C: Del.icio.us, Furl, Netvous, Bluedot and Ma.gnolia, but tagging has a solid B2B value proposition as well.